For those that attend, college can be a pivotal time in young adulthood. During those years, people work to formulate their identity for the first time away from the shadow of their parents, and many of the ideas they may have known as “truth” may be challenged. In the case of LGBTQ students, college can often be the time when they not only learn who they are, but learn that it is ok to be who they are. Studies at a supportive, LGBTQ-inclusive university can make all the difference in the world to someone taking this life journey. This past year the University of Houston student senate passed the Josephine Tittsworth Act. The student bill is an attempt to address the safety concerns of transgender people on campus. The bill allows transgender students to use their proper name, title, and gender when completing official university documents. Today the university boasts a full-service LGBT Resource Center with a program director, student staff, a large selection of annual programming, and an LGBT studies program. As stated, the mission of the center is “to launch the next generation of healthy, proud, academically successful LGBTQ citizens, leaders and advocates.” Some of the center’s key programs include a Peer Mentoring Program to help assist newly LGBTQ-identifying students, a speakers bureau, and a brown bag social lunch to help foster relationships between students and faculty. 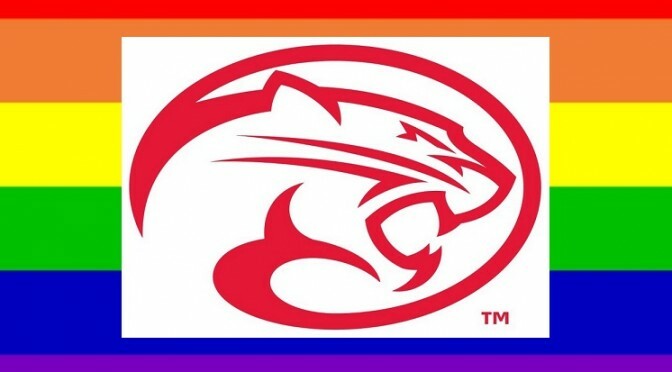 Programs for faculty and staff include the Cougar Ally Training on LGBTQ issues as well as multiple Cougar Ally Lunch ‘N’ Learns, which provide discussions on select LGBTQ issues. I’m happy that the work of the University of Houston Student Government Association has been recognized and I think it really shows the impact a small group of students can have. Many of the reasons UH has become more inclusive and welcoming of the LGBT community have been because of small groups of students who have pushed for action from our leaders. It’s a clear indication that even in the South, we can make change happen. Furthermore, I think this really shows the type of impact student government can have if we work hard and act professionally. This is what student government should aim to do, we shouldn’t be starting public fights with our allies in the Texas Senate like the current SGA president has done. Lee, along with other University of Houston student leaders and alumni, also played an integral role in the recent passage of the Houston Equal Rights Ordinance by giving testimony at Houston City Council, lobbying Council Members before the vote, and organizing support within the community. In 2008, UH became the first university in Texas to offer an LGBT studies minor, and the program has remained popular ever since. With support from all levels of the campus community, students can definitely find a place to belong at UH. In most statewide election cycles, the typical focus is going to be on some key races… the Governor, Lieutenant Governor and state legislature. The first two because they are the highest elected officials in the state, and the legislature because they are the ones who represent constituents at capitol, and those who make the laws. But in Texas, there is another race that sometimes matters more than any of these others, especially for citizens that have to deal with a court of law. Once elected, the Attorney General set important and far-ranging legal procedures that have a huge effect across the state. It’s an Attorney General that chooses how and to what extent that punishment for law breakers (or convicted of being a law breaker) will be pursued. Will the person caught with an ounce of hash have to pay a fine not unlike that associated with a traffic ticket, or will that ounce mean that they have to lose their job, their home, and completely change the trajectory of their life after serving a prison sentence? More often than not, these life-altering decisions are made by attorneys, and the Attorney General is the most powerful amongst that group. Democratic candidate for attorney general Sam Houston wants his opponent, state Sen. Ken Paxton, to agree to a debate ahead of the November general election. Houston is expected to issue the challenge Wednesday at a news conference in Austin, demanding his Republican opponent “quit hiding from the media and the voters,” spokeswoman Sue Davis confirmed. Houston contends his opponent hasn’t made a public appearance in months, ever since Paxton admitted to repeatedly soliciting investment clients over the last decade – a service for which he pocketed up to a 30 percent in commission – without being properly registered with the state as an investment adviser representative. Paxton’s campaign called Houston’s demand for a debate “desperate”. But what is so desperate about wanting Texans to know your views on particular issues? Just like Greg Abbott last week, Ken Paxton’s excuse to avoid a debate sounds like it’s motivated purely out of fear that if Texans learn the truth about him and his views, they won’t agree. The art of debate and argument is critical to being a lawyer. 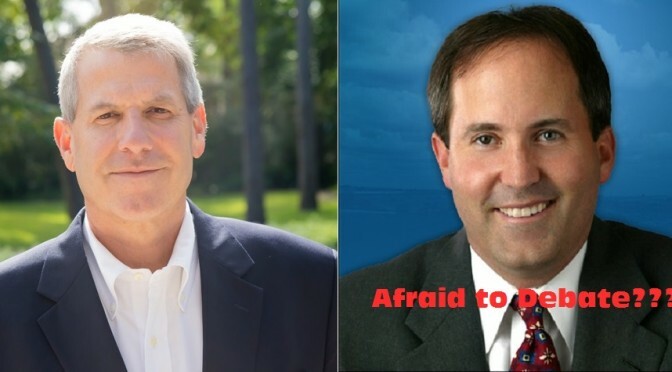 If Ken Paxton can’t agree to one debate, then he doesn’t deserve to be the state’s top lawyer. Let’s hope the Sam Houston campaign and Texas Democrats keep up the pressure.